I bought a mid century kidney shaped coffee table in excellent condition, but it’s missing the metal feet. Where might I be able to find replacements — preferably in silver. You ask — we research! This was actually a bit more complicated than expected, because we had to learn about ferrules and sabots first. But we have three places to find replacement table let feet for you, Kathy. What is a ferrule? What is a sabot? In order to be able to find the metal tips that Kathy needs to restore her table, we first needed to understand what these “metal leg tips” are actually called. Pam asked me to do some research on the subject, and I found that these metal tips are referred to as both ferrules and sabots. What better place to look for answers to this question than my mid century furniture making books? 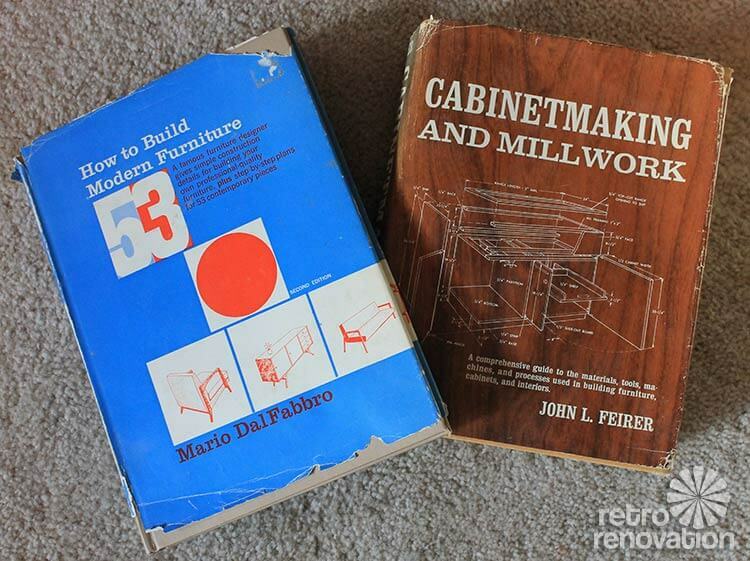 First I checked Cabinetmaking and Millwork by John L. Feirer. 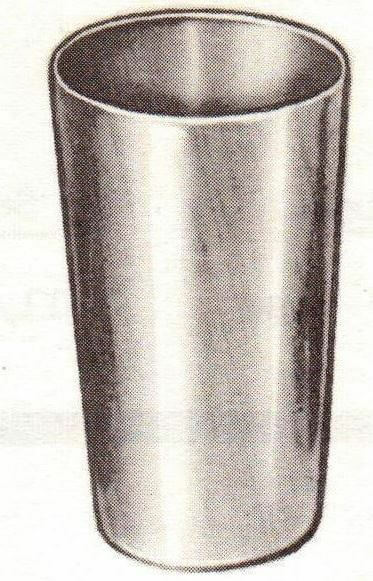 In this book’s section about furniture legs, five different styled metal leg tips were shown and referred to as ferrules. A usually metal ring or cap that is placed around the end of a wooden stick or handle to strengthen it. Rubber, plastic tacks, and metal glides are the end fittings most commonly used with wood legs to prevent scratching of the floor. Other types largely used include the ferrule metal shoe, metal shoe with adjustable glide, and swivel glide caster. After looking up the word sabot, I found that it means “shoe” in French. Ferrule: Normally a metal cap attached to the end of a slender shaft for strength or to prevent splitting. Sabot: A French term for the gilt-bronze “shoe” at the bottom of furniture legs. Having read all of this, I believe that when referring to “mid century metal furniture leg end caps or tips or shoes” either term — ferrule or sabot — is technically correct. I’m thinking: A sabot is always a ferrule, but a ferrule is not always a sabot — as a ferrule could also be used to strengthen a part other than the end of a furniture leg. With proper terms now in place, I began the search for replacement ferrules/sabots. 1. Pampco, Inc. — Pampco, Inc. was the first company I found that mentioned manufacturing ferrules, sabots and leg protectors for straight or tapered furniture legs. Their website didn’t offer much information on the specifics of ordering their products, so I reached out to the company for more information. We do in fact make leg ferrules and our company probably made a lot of the ones that you or your readers have on tables or chairs. We will be able to manufacture something if we have tooling for it. The best way to determine this, is to forward us the top inside dimension, bottom inside dimension, and the height. That way we can look at our existing tooling and see if we can find a match, or something close that may work. Unfortunately due to the time sensitive nature of our business, we had to implement a $100 minimum charge in order to keep our production schedule on track and satisfy our customers with larger orders. While is seems like Pampco, Inc. is an authentic producer of ferrules for mid century legs — the company has been making them since 1930 — their $100 minimum order (an assuming they have a tooling match) doesn’t make them a likely source for individuals who are looking for one or two or even four ferrules to repair their retro furniture. These steel brass-plated tapered ferrules from IFSCO are just $1.50 each, but you must order 16. 2. 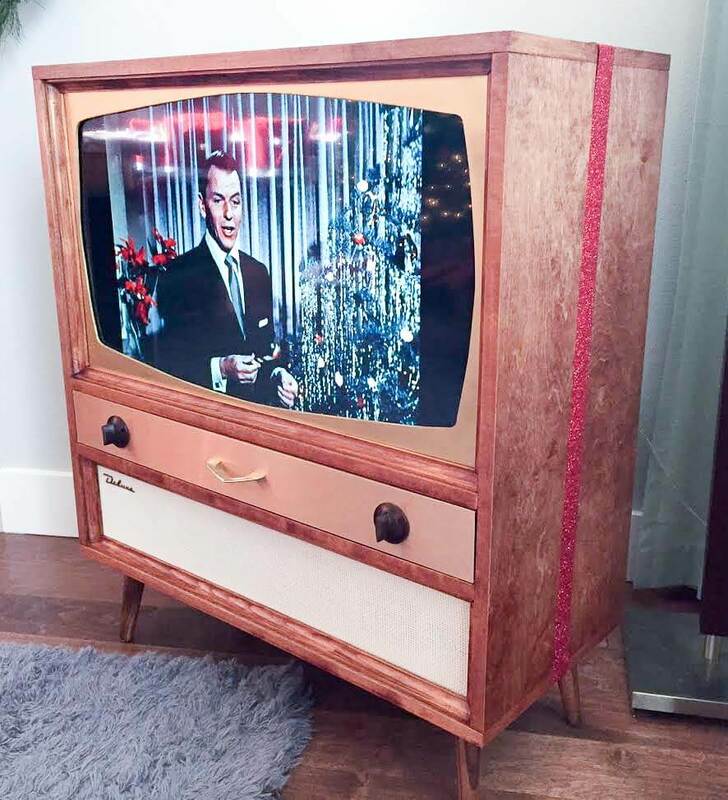 IFSCO Industries — The search continued, and led me to another authentic retro company in business since 1946 — IFSCO Industries, Inc. — which offers five sizes of steel brass plated ferrules to fit wood furniture legs. At $1.50 each, these ferrules could be an excellent solution for small scale furniture repair except for the minimum purchase quantity of 16. Still, if they have the measurement you need for your furniture repair project, ordering 16 ferrules would cost $24 — much lower than the $100 minimum order needed for Pampco, Inc. and the cost of just two (all-brass) ferrules from tablelegs.com (profiled below.) 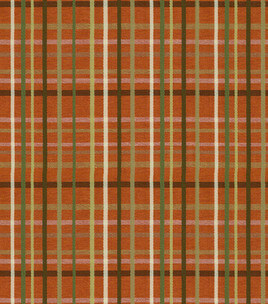 Note, IFSCO Industries, Inc. also has a juicy looking selection of vintage vinyl colors and patterns including retro favorites like pink, aqua, pale yellow, orange, olive and goldenrod that can be purchased by the yard; the company is gearing up to load all this inventory in ebay and will let us know as soon as they are ready to sell it efficiently via that channel. Watch the blog! 3. Tablelegs.com –– I ordered McCobb style mid century legs for my bathroom vanity from the third source on today’s list, tablelegs.com. 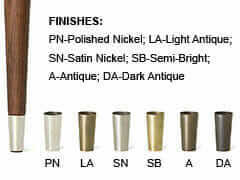 I noticed they have added several new products, including metal tips for their mid century styled furniture legs. 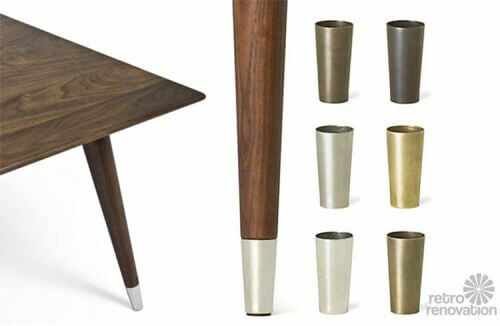 The metal tips — or ferrules — are made in six finishes and are fabricated to fit their offering of McCobb wooden legs. 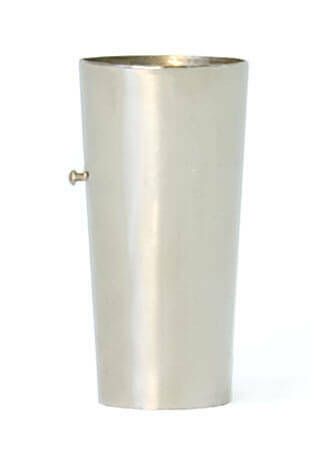 These metal tips are designed to accent the line of Mid-Century Modern McCobb Table Legs. The tips, also referred to as ferrules, are a hefty weight. No skimping here. Made from solid brass. Choose from six finishes. When you buy McCobb Mid Century Modern Legs to go with these metal table leg tips, the leg will be serviced with a turning to accommodate the thickness of the brass ferrule. Tip slides onto table leg and attaches securely by a brass pin that taps into wood. These metal tips are not cheap — $11.95 each, but they are made of solid brass and will likely hold up for many years to come. I am unsure if these ferrules fit vintage mid century legs, but you could contact the company to compare the measurements to your existing table legs with the ferrules they offer and possibly find a match. 4. Horton Brasses, Inc. — A tip from Facebook follower Tom lead us to Horton Brasses. $7.95 – 10.53 ea + shipping. I’m trying to find out how to replace parts of my dressing table. What are the metal rings between the top of the fluted legs and table called and where do I get them? 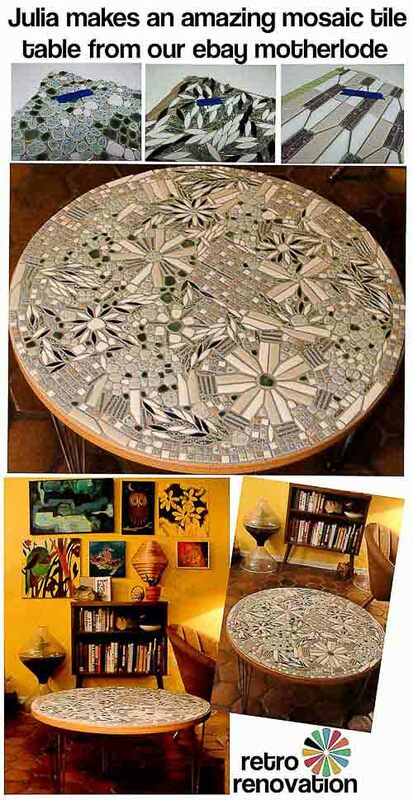 I have a modern coffee table with 1 3/8″ diameter metal legs. I need to find ball casters or cup casters to fit this size diameter leg. I see what i need at Ali express,but order in bulk of 200. Van Dyke restorations has something like that, but they are too small. Where I can find refitting caps for my table? I am looking for leg tips that will increase the height of my mid century Moller dining chairs. Do any of the leg tips mentioned in this thread increase the height or just fit over the existing leg? Thank you! I am not sure. I recommend you ask the company, including if they have any other products to do that. Good luck.